As a physical therapist, I have treated a lot of people with back and neck pain. And during those years, numerous patients have asked me what brand of massage cushion/chair they should buy for at home or at work to help alleviate their tight muscles. At that time, I was unable to recommend a certain brand, since I had never had the opportunity to really try one. So, when Relax The Back approached me about doing a product review on their “Back and Neck Massage Cushion,” I jumped at the opportunity. 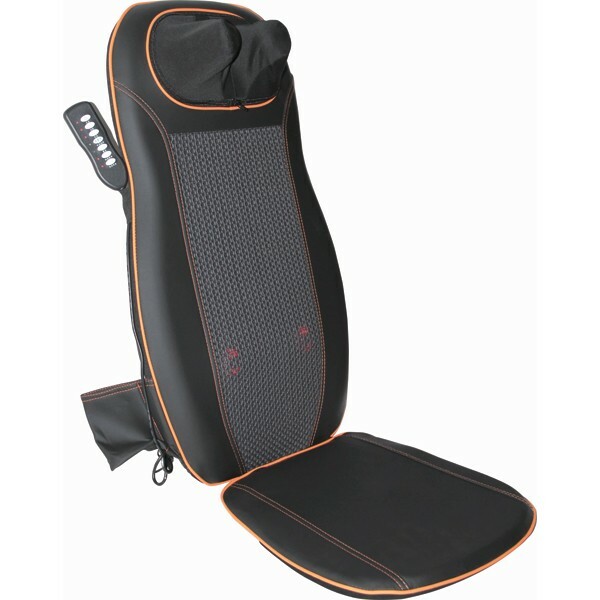 Back massage cushion: The contoured back cushion has four heated, rotating heads that knead their way up from your low back to your upper back. Neck massager: While connected to the back massage cushion, this portion has a separate control button, so it can be used or not used according to your preference. Comfort: The massage cushion was comfortable to sit on. Effectiveness: The four rotating heads did a good job of relieving muscle tightness, especially in the upper back. Adjustable: It is adjustable somewhat for different heights, but I could see it being problematic for exceptionally tall or exceptionally small people. I can’t give exact heights, but one person that I had try it that was 6’1” seemed close to the upper limit. Portable: It could be easily moved from one chair to the next and easily stored in the closet when not in use. Neck Massage not adjustable: The neck massager can be a little rough and not everyone will enjoy the deep kneading massage it provides. This is a good massage cushion and I would definitely recommend this cushion to my patients who were looking for a massage cushion as long as they were not elderly and didn’t have pressure sensitivities. The kneading is deep, which is good for those that enjoy that, but those with pressure sensitivities may not be able to tolerate the level of kneading provided by this product. Unfortunately, there is no option for less kneading. You can, however, turn it off. Or you could sit with a little less pressure against the cushion. Overall, the product did a good job targeting and alleviating muscle tightness and I liked the portability of it. All of the people that I had try it said they enjoyed it as well. At $269 it isn’t cheap, but from what I found it was in about the middle of the price range for similarly featured massagers. I have to say that I definitely enjoyed it and would use it again. In fact I might just do that after I post this review. Oops! Before I go enjoy a well earned massage, I almost forgot! The people at Relax My Back, who you can find at their website at RelaxTheBack.com or on their facebook, were kind enough to offer us a Back and Neck Massage Cushion for us to giveaway to one of our lucky readers. Every contest needs rules, so here they are. If you want to win you have to reside in the United States or Canada. Sorry to our international readers, maybe next time! If you’re still eligible, please write a comment on this post telling us what you would do if you won this cushion. Then on September 10, 2012 we will do a random drawing. We’ll contact the winner via email and get your information then to have Relax the Back send you your prize. This would be a really nice birthday gift! my birthday is on September 13th! Sounds like a great massager. Would love to win this and be able to enjoy a nice relaxing massage while I am working on the computer, reading a book or watching a little tv. Great review. I had a chance to try the “Back and Neck Massage Cushion” and I liked it very much specially the deep kneading and the neck massage. I would love to have a “Back and Neck Massage” because I could use it for after working in the yard or doing certain house cleanings. I would attach this to my computer chair so I could relax while I surf the net. I would be using the massage cushion for all it’s worth!! Would love this for long car rides and after long car rides. I am currently sitting at work with a lumbar support contraption from Dollar Tree and a heating pad, because my neck pain that stems from staring down at my laptop has trickled down to my back. Please know that I will put this to good use. Thanks for the great review and opportunity to win. After hours at the computer, my back and neck would certainly enjoy the massage cushion. Sounds like a little piece of heaven for my tense and achy muscles! Thanks for your generosity by offering the contest. I would like to use on my clients and for my own holistic health. This would be perfect for me! I would probably use it every day for my chronic back pain. I could really use a messager like this, because I like most people replying have horrible back pain and spasms. I currently can’t work and have horrible insurance, so I can not have this dealt with at this time so yeah a comfortable and well made messager would sure be a blessing. As Robyn stated it is truly generous of you to offer such contests and I too thank you. I would feel better if I won!!! 🙂 Being shorter, I always need a little extra behind me to feel better when sitting PLUS my desk chair needs this big time! Very nice, & resembles one I’ve used in my car for many years. I would share it with all my friends/co-workers at school! My aching scoliotic back would love this! Thanks for the giveaway. Are you giving away a pair? I might love to win these! I’ve subscribed!